The International Stage has always been one of my favorite spots at the AJF. The smaller stage provides an intimate feeling, yet you are still outdoors. The artists come from areas all over the globe, often bringing a fresh and exciting perspective to jazz. I’ve discovered artists there who have now become some of my favorites. Last year, the International Stage gave me my first exposure to the magnificent vocalists Somi and Cyrille Aimee. In 2012 I heard trumpeter Melvin Jones for the first time and immediately became a fan. And in 2013, the lady considered by many to be the brightest young vocal star in jazz, Cecile McLorin Salvant, performed there. This year the International Stage features two well-known artists as headliners on each of its two nights, plus the usual array global talent who will give us all an opportunity for stimulating discovery. The Bank of America Youth Jazz Band Competition allows young jazz musicians from all over the Atlanta metropolitan area the opportunity to showcase their talent. The competition focuses on artistic and technical merits and features an outstanding judging panel. The North Atlanta School for the Arts Jazz Band finished in third place this year, which earned them a $500 scholarship and an opportunity to perform on the International Stage at AJF38. This young Israeli guitarist/vocalist is a talent to keep an eye on. 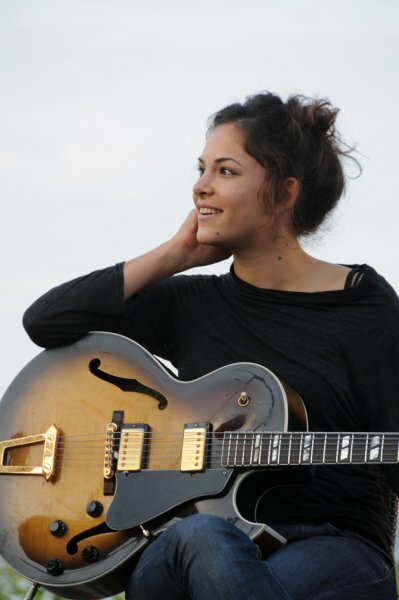 She plays full-toned guitar lines with a sound reminiscent of a young Kenny Burrell. And she sings in an inviting, winsome voice with just a hint of Blossom Dearie. A recent graduate of the jazz program at The New School in New York, Ms. Pelled has clearly caught the ear of others as she was joined on her debut album Dida Plays and Sings, by Roy Hargrove on trumpet and Gregory Hutchinson on drums. Watch out for her new album, with Sam Yahel on organ, due out this month. This is a set that I will not miss. Banda Magda is an eclectic group of very gifted musicians led by the Athens, Greece born singer/songwriter/multi-instrumentalist/film scorer, Magda Giannikou. Their energetic, musically diverse and downright fun, stage performances have won them fans around the world, including The Kronos Quartet and comedian Louis CK, who performed a duet with Magda on his TV show. Banda Magda’s current album Yerakina, is climbing the World Music charts now, while they are in the studio working on their third album, Technicolor Tigre. If the legendary Quincy Jones agrees to mentor an artist, it means that he or she must be bringing killer chops to the table. “Q” is not only Alfredo Rodriguez’s mentor but he is the co-producer of his Grammy nominated latest release, The Invasion Parade. Since coming to the U.S. in 2009, the Cuban born pianist has turned the Latin and Afro-Cuban music scenes on it collective ear with his dynamite original compositions, and his inventive takes on the Cuban classics that he grew up with. Being able to catch Mr. Rodriguez in a setting like this is a rare treat that should not be missed. You can hear tracks from these and many other 2015 Atlanta Jazz Festival performers on Curt’s Cafe Noir, our 24/7 streaming jazz station, from 5 pm – 7 pm (ET) daily, through the end of May. This entry was posted on May 11, 2015 at 9:54 pm and is filed under Atlanta Jazz Festival 2015 with tags alfredo rodriguez, atlanta jazz festival, banda magda, dida pelled, jazz. You can follow any responses to this entry through the RSS 2.0 feed. You can leave a response, or trackback from your own site.